For large volume orders, please call, e-mail, or fax us for inqiries about discounts and better shipping rates! Deep Dish 3 Spokes Design Wheel. Replaces your old/Stock Steering Wheel. Wrapped with PVC Leather to Improve Grip , Handling and Control. 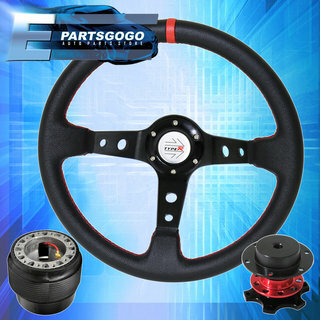 350mm Diameter Steering wheel with Aluminum Center. 100% Brand New, never been used.